This article is about Shulk's appearance in Super Smash Bros. Ultimate. For the character in other contexts, see Shulk. Shulk (シュルク, Shulk) is a playable character in Super Smash Bros. Ultimate. He was confirmed on June 12th, 2018. Shulk is classified as fighter #57. Adam Howden and Shintarō Asanuma reprise their roles as Shulk's voice actors in the English and Japanese versions of the game through mostly reused voice clips from Super Smash Bros. 4. Play VS. matches, with Shulk being the 22nd character to be unlocked. Clear Classic Mode with Pikachu or any character in its unlock tree, being the second character unlocked after Villager. Have Shulk join the player's party in World of Light. With the exception of the third method, Shulk must then be defeated on Gaur Plain. Shulk has received a mix of buffs and nerfs from his transition to Ultimate, but was buffed overall. His infamously sluggish moveset has been sped up in several ways, most notably from the universal reduction of landing lag and lag reduction for some of his most commonly used moves, alongside the ability to autocancel some aerials, a trait he was previously notable for lacking. This eliminates his biggest weakness in Smash 4, as his aerial landings were notoriously punishable. In addition, his KO moves are now stronger, the implementation of canceling a dash with any ground move allows him to approach with his high-ranged tilts, and the addition of pseudo-dash dancing alleviates his previously low traction and turnaround time. Shulk's defining Monado Arts have also been altered significantly, now performing much like Hyper Monado Arts from Smash 4. Their benefits have been boosted: Speed and Buster now grant Shulk true followups and throw combos, Shield allows him to stay grounded even after withstanding smash attacks at high percents, and Smash now buffs Shulk's KO potential to such an extent that he is capable of KOing extremely early with throws and tilts. However, Shulk's previously heavy weight has been reduced, his very damaging and long-reaching neutral attack has been significantly toned down, his back aerial has lost its large early body hitbox, and his throws are all less damaging, with down throw no longer being the strongest in the game. His infamous Vision had its knockback reduced, making it less effective for KOs at at high percents, and it is no longer unblockable. Finally, his Monado Arts also last significantly shorter, have much longer recharge times, and their drawbacks have been amplified, making each Art even riskier to use but much more rewarding. As a result, Shulk's playstyle revolves less around taking advantage of Monado Arts at all times, and he now depends on using his improved kit to make use of his stronger, shorter-lasting Monado Art abilities. As of now, it is unknown how his changes affect him compared to the rest of the cast. As with all veterans returning from SSB4, Shulk's model features a more subdued color scheme. In addition to losing most of the glossy sheen from his clothes and hair, Shulk's clothing now features simple detailing, his face is more defined, and his hair is somewhat less tousled. Shulk's alternate costumes now alter his hair color to match each party member they represent. His hair colors are now dirty blonde, black, auburn, black, silver, and orange for the palette swaps of Fiora, Dunban, Reyn, Sharla, Melia, and Riki respectively. Shulk's muscles are more prominently defined in his shirtless alternate costume. Shulk's idle stance has been slightly altered, as his chest now visibly moves as he breathes. The Monado's blue glow during certain moves (such as the first hits of up smash and up aerial) has been made brighter and more noticeable. Shulk's second jump freefall animation has been altered, with his limbs no longer being straightened out. This brings it closer to how Shulk jumps in Xenoblade Chronicles. During Shulk's hip-posing victory pose, the Monado now glows with a sword trail when swung, and Shulk gives a wide grin at the end. Shulk sports a grin at the end when performing the Monado-swinging victory pose. Shulk now grins when applauding the winner after a match. The Monado's beam blade no longer becomes misaligned on stages with a 2D effect, like Flat Zone X.
Shulk's armorless costume no longer causes the "extended neck" bone error, although it still causes the Monado's Art symbols to flash above Shulk's neck during hitstun. Like all characters, Shulk's jumpsquat animation now takes three frames to complete (down from 5). Shulk dashes faster (1.52 → 1.672). Shulk's traction has been increased (0.044 → 0.94). This improves his ability to punish out of shield, and also improves his overall mobility as well. Shulk air speed is faster (1.06 → 1.113). Shulk is lighter (102 → 97), reducing his endurance substantially, however, this change makes him less susceptible to combos. Neutral attack's first hit animation has been altered, and the second hit is a full roundhouse kick. Neutral attack's first hit has a smaller hitbox and less range due to its animation change. Neutral attack deals significantly less damage (3.5%/3.5%/5.3%(clean)/4.2%(late) → 2%/1.5%/5%(clean)/4.1%(late)), no longer being the most damaging non-infinite neutral attack in the game. Neutral attack's consecutive jab is slower. Due to neutral attacks dragging opponents to the ground, neutral attack is no longer timing-specific against floatier or significantly damaged fighters. The first two hits can also jab reset. Forward tilt deals more knockback (KOs at 108% → 97% (edge of Final Destination)). Up tilt deals more damage (blade/beam: 8.5%/7.5% → 10%/9%). Up tilt has more horizontal range at the beginning. Up tilt's ending animation has been altered, with Shulk crouching lower. Due to changes to the Buster art, up tilt's freeze frames and higher horizontal launch angle makes it difficult to follow up itself. Down tilt has more range, with the hitbox matching the beam blade. Like his other sword-based moves, dash attack has a sweetspot and sourspot which makes the move no longer deal consistent damage (11.5% → 12.5%(blade)/11%(beam)). Dash attack has less startup lag (frame 15 → 12). Dash attack has significantly less ending lag (FAF 53 → 40). During dash attack, Shulk doesn't slide as far. This reduces the move's range slightly. Dash attack has less knockback scaling (80 → 68). As characters no longer slide through other fighters, dash attack will no longer whiff against opponents that are very close. Forward smash deals more knockback (KOs at 84%/97% → 73%/86% (blade/beam, edge of Final Destination)). The removal of MonaDACUS significantly hinders Shulk's up smash approach potential as Monado Arts cancel the increased momentum immediately. Down smash's first blade hitbox deals slightly more knockback (KOs at 81% → 78% (edge of Final Destination)). All aerials have less landing lag (Neutral: frame 10 → 6, Forward: 16 → 10, Back: 19 → 11, Up: 15 → 9, Down: 23 → 14). Neutral aerial executes much faster. Neutral aerial's hitbox timing is unchanged despite the faster animation speed, meaning the ending frames can connect with opponents, and the full move covers 360 degrees. Neutral aerial has significantly less ending lag (FAF 71 → 60). Due to its landing lag being reduced, neutral aerial can true combo into several aerials depending on Shulk's active Monado Art. Neutral aerial's sweetspot has been reversed, with the beam blade dealing less damage instead of more. While this increases the chance of the blade hitbox hitting at the beginning, this also makes the larger beam hitbox more likely to land after the initial startup . Forward aerial has less startup lag (frame 14 → 13). Due to its landing lag being reduced, neutral forward can true combo into itself or other aerials depending on Shulk's active Monado Art. The final frames of forward aerial no longer send opponents behind Shulk. This removes its niche stage spike and combo abilities, but makes it more consistent. Back aerial can auto-cancel in a full hop. Back aerial's hitbox has been adjusted to be parallel to the ground. This makes it easier for the attack to hit grounded opponents without going over their heads. Back aerial's early hitbox has been removed, preventing the Monado's blade from hitting opponents in front of Shulk. This also makes it more difficult to use back aerial as a landing option. Back aerial starts slightly later (frame 18 → 19). Coupled with the changes to the Speed Monado Art, this makes short hop back aerials more timing-specific in the Speed Art, as Shulk has to perform the back aerial immediately out of a short hop. Up aerial has significantly less ending lag (FAF 71 → 60). Down aerial has more range. Pummel deals less damage (3% → 1.2%) but is much faster. Forward throw's second hit deals less damage (8% → 5%). Forward throw is much stronger with the Smash art active, capable of KOing at 110% at the edge of Final Destination. Back throw's second hit deals less damage (9% → 6%). Back throw is Shulk's strongest throw with the Smash art active, capable of KOing at 90% at the edge of Final Destination. It surpasses Ness' back throw in KO power when the Smash art is active. Changes to the Smash art allow the Monado Purge combo (up throw to up air) to KO at around 70%, though this is escapable. Down throw has a snappier animation, with Shulk performing a short jump before the main hit. Down throw's second hit deals less damage (4% → 2.5%). Down throw is no longer the strongest down throw in the game, even with the Smash Art active. Changes to the Buster Art allow down throw to true combo into various moves at a wide percent range, and can also be buffer canceled to lead into KO followups without Arts. Monado Arts can be selected quicker by holding the Special button, holding the stick in a direction, then releasing the Special button. His Monado Arts are mapped to the following: up for Smash, upper left for Jump, lower left for Speed, upper right for Buster, and lower right for Shield. The previous method of selecting Monado Arts has still been retained. This new method of switching allows the user to switch Monado Arts without needing to cancel the current one, opening up more combo potential and flexibility through switching from certain Monado Arts. Arts that are on cooldown have a bar under them to show how much longer until they can be used again. A timer bar also appears to show how long until the active Art deactivates. Monado Arts can be activated immediately during hitstun. Monado Arts activate significantly faster when selecting Arts individually. Monado Art Landing Lag Canceling is still capable of being performed, though the faster activation time means the timings require quicker reflexes. Additionally, its usage to reduce landing lag is negligible due to the universal reduction to landing lag. The addition of selecting Arts through the Art wheel allows Shulk access to MALLC at any time, without having to time landings with his jumps. It also grants access to the Dial Storage technique. Monado Arts's kanji graphics are stylized and shown in solid colored, thick-outlined text. Upon activation, the kanji flashes with a cartoon-styled burst. Monado Arts displays the name of the art in addition to the kanji, like on the HUD. Switching or deactivating Arts immediately resets Shulk's movement attributes (e.g. he no longer keeps his high dash speed if he is dashing when the Speed Art expires). This removes some advanced techniques such as Monado Art Run Cancel, Monado Art Buffered Deactivation, and MonaDACUS. Monado Arts have significantly amplified strengths and weaknesses, alongside much shorter durations and longer cooldowns, making the move similar to his previous custom move, Hyper Monado Arts. Jump Art lasts significantly shorter and has a longer cooldown (16s → 6s duration, 10s → 18s cooldown). Jump grants higher air speed (1.5x → 1.7x) and falling speed (1.22x → 1.4x), making it more effective for aerial movement. Short hops in the Jump Art will automatically go through platforms (such as the ones on Battlefield), allowing Shulk to use his short hop aerials without interruption. Jump Art increases Shulk's damage vulnerability even more (1.22x → 1.3x). Speed Art lasts significantly shorter and has a longer cooldown (16 s → 8s duration, 10s → 16s cooldown). Speed Art grants an even lower jump and higher run speed (1.7x → 2x) than before. Combined with the reduced landing lag of his aerials, Speed is a more effective aerial rushdown and spacing tool. Much like the Jump Art, full hops in the Speed Art will automatically go through platforms, allowing Shulk to use his full hop aerials without interruption. Due to the altered dash mechanics, Speed grants Shulk an excellent dash dance. Speed Art lowers Shulk's damage even more (0.8x → 0.7x). Speed Art's shorter jumps make the Art even worse for recovering vertically. Shield Art lasts significantly shorter and has a longer cooldown (16 s → 6s duration, 10s → 18s cooldown). Shield Art grants a higher damage resistance (0.67x → 0.5x) and reduces knockback taken (0.78x → 0.5x) even more. As a result, Shulk can survive almost any KO move even at high percents. He can also interrupt throw combos or tilts by retaliating with an attack while Shield is active, since he can usually react faster than his opponent. Due to the new selection method for Monado Arts, Shield can be activated during most multi-hit moves. This allows Shulk to break out of a variety of situations, including potential game-ending strings. Shield Art has further increased shield health and shield regeneration rate (1.5x → 2x). Shield Art lowers Shulk's damage (0.7x → 0.5x) and knockback even more. Buster Art lasts significantly shorter and has a longer cooldown (16s → 10s duration, 10s → 14s cooldown). However, it is the longest-lasting and quickest-charging Monado Art. Buster lowers Shulk's knockback even more (0.68x → 0.65x) and grants significantly higher freeze frames. This gives Shulk true combos while it is active, significantly improving his damage racking potential. The new method for selecting Monado Arts give Buster KO confirms, such as a Buster down throw into Art-canceled Air Slash or Buster back throw into Art-canceled Back Slash. Buster Art increases Shulk's damage vulnerability even more (1.13x → 1.3x). Smash Art lasts significantly shorter and has a longer cooldown (16 seconds → 8s duration, 10s → 16s cooldown). Smash Art further boosts Shulk's knockback (1.18x → 1.25x), allowing his fully charged smash attacks to KO as early as 22%. Smash Art increases Shulk's launch rate even more (1.07x → 1.2x). This makes his survivability the worst in the game while Smash is active. Smash Art lowers Shulk's damage even more (0.5x → 0.3x). Back Slash's back-hitting blade hitbox deals more knockback (79% → 74% from the edge of Final Destination). Shulk can snap onto ledges while using Back Slash, after enough travel time. Back Slash can travel three different distances depending if the player holds down left, right, or no buttons. Back Slash is less situational because characters do not turn around after being hit from behind. Front-hitting Back Slash has lost its stronger hitboxes. As a result, it KOs later. Back-hitting Back Slash causes a yellow burst effect, similar to the graphic shown when a party member successfully lands an Art's bonus effect in Xenoblade Chronicles (in this case, hitting the back of an enemy). Air Slash's second hit deals more knockback. Air Slash's second hit has less startup lag, making it easier to connect both hits of the move. Air Slash snaps to the ledge during the first swing instead of the second swing. Air Slash has a smaller edge sweetspot, making the entire move harder to snap to the ledge with. Vision's backdrop is significantly brighter. Vision no longer has a sourspot. As a result, its minimum damage is 10%/13% (normal/forward-held), improving its consistency. Except for the forward-held version, Vision’s counterattack has a longer duration, with the aerial version having less startup (frame 45-46 → 45-47 (grounded)/40-42 (aerial)) and both versions having less ending lag (FAF 97 → 88 (grounded)/83 (aerial)). Vision gains more intangibility frames during the start up frames which prevents opponents from canceling the counterattack by a move dealing knockback. Vision is no longer unblockable. Both versions of Vision have less knockback growth (normal: 84 → 70, forward: 94 → 80), hindering its KO ability. However, due to changes to Smash Art, Vision can KO much earlier despite its decreased damage multiplier. Vision Sliding has been removed. Fiora appears during Chain Attack, attacking with Shulk in addition to Riki and Dunban. Camera angles have been adjusted to accommodate for her, and Shulk has gained an additional voice clip that calls out her name. Additionally, Riki and Dunban have more detailed models. Infinite Monado Arts along with RCO lag on every aerial move affected by the glitch has been removed. Forward aerial auto-cancels earlier (frame 45 → 42), matching the move's interruptibility. It can also now grab on ledges after the entire move. Up Aerial can now grab ledges after the entire move. Floor attack has more range. Edge attack has more range. Shulk's damage outputs and knockback can be manipulated by Monado Arts. The following moveset list details the properties of his attacks when he has no active Monado Arts. 2% A jab, followed by a full roundhouse kick then an upward slash. It now connects consistently compared to the version in Smash 4, and the first two hits can now jab reset, though its slim hitbox makes this difficult on most prone characters. It also has very low range compared to his other moves, but is very fast in comparison (frame 5). Its second hit loosely resembles Dive Sobat, one of Reyn's Physical Arts, albeit being an inward kick instead of outwards. 13.5% (blade), 12% (beam) An inward slash. Its impressive damage output and high knockback growth make it powerful for a tilt attack. While near the edge of Final Destination, its blade hitbox KOs at roughly 97%. It also deals high shield damage when Buster is active. However, its range is shorter than Shulk's other moves, while its narrow hitbox allows smaller characters to crouch under it. It is based on one of Shulk's basic Auto Attacks. 10% (blade), 9% (beam) An overhead arcing slash. It wide hitbox and sheer range make it a useful move overall, since it can almost reach the top platform of Battlefield and function as an anti-air attack, limit edge get-up options, pressure shields, or trap landings. With Buster active, it is a useful damage racking option from under platforms. Without Arts, it can also function as a situational KOing option thanks to its high knockback growth: it can KO grounded opponents at 160% without rage, and functions as one of Shulk's strongest KO moves with the Smash Art, KOing within the 105% range. However, it only hits in front of Shulk at its beginning, and has moderate start-up and ending lag. 9.5% (blade), 7.5% (beam) A kneeling inward slash. Moderately slow for a tilt attack, but it has good range and the lowest amount of ending lag out of his entire moveset. As a result, it is a good combo starter while Jump, Speed, or Buster are active. Unlike the version in Smash 4, the hitbox now covers the end of the beam blade. When spaced correctly, it is also able to hit edge-hanging opponents once their invincibility ends. 11% (beam),12.5% (blade) A braking inward slash. Somewhat short ranged but can connect easily. When it is coupled with its decent damage output, it can function as a situational KOing option. While near the edge of Final Destination, it KOs middleweights at around 160%. However, it has high ending lag (28 frames). 5.5% (hit 1), 13% (hit 2 blade), 11.5% (hit 2 beam) A thrust, which causes the Monado to reveal its beam blade. It consists of two hits: the first is from the Monado's blade, which leads into the second hit from its beam blade. It is the fourth longest ranged non-projectile forward smash in the game, surpassed only by Simon/Richter, Corrin, and the Mii Gunner. When coupled with its ability to be angled, it can hit opponents attempting to grab the edge. The Buster Art grants the move good shield-pressuring potential, as it can deplete half a shield. While near the edge of Final Destination, the non-angled blade/beam KOs at 74%/86%. However, the first hit's low priority makes it easily canceled by weak attacks, while the move's high ending lag (44 frames) makes it completely unsafe on shield. As a result, it is best used as a punishment option, or a high-risk high-reward mixup against approaching opponents. It is based on Slit Edge, one of Shulk's Physical Arts. 4.5% (hit 1), 13.5% (hit 2) Squats and slams the Monado's hilt onto the ground, causing its beam blade to thrust upward. An overall effective move for punishing, as the first hit's deceptive horizontal range launches opponents into the second hit. This allows it to punish rolls, landings, and edge get-up options. The second hit's vertical range, high knockback and transcendent priority allow it to KO reliably. Unlike forward smash, it does not possess a sweetspot and sourspot, which also gives it consistent KO potential at around 109%. The move has considerable start-up (hits on frame 18) and ending lag (37 frames), making it punishable. Hit 5: 6% (blade), 4% (beam) A crouching spinning slash with the Monado, with Shulk spinning in a full circle thrice. It is capable of hitting during any of its five hitboxes (three at Shulk's front and two at his back), with its first hit being strong enough to KO reliably near the edge at 78%/85% (blade/beam). Each spin quickly loses power, but the final spin has slightly more range. The Smash Art grants the later hits KO potential, despite their weak power without any Monado Arts. It is usually impossible to connect more than one hit together unless Buster is active, in which case it will break full shields if an opponent is cornered at an edge and the first three hits land. Extremely useful for punishing rolls and sidesteps thanks to its multiple hitboxes and range, but suffers from the most overall lag out of Shulk's smash attacks because of its considerable start-up (hits on frame 18) and ending lag (41 frames). It resembles War Swing, one of Reyn's Physical Arts. 8.5% (blade), 7.5% (beam) A circular slash around himself. It is one of Shulk's most useful approach options, thanks to its wide range, full 360 degree coverage, low landing lag (6 frames) and long duration. Unlike the Smash 4 version, the hitboxes now match the trail until the end where the Monado retracts its beam blade. Its hitbox begins slightly behind Shulk's toes and continues all the way over his head, allowing the initial frames to start combos if an opponent misses a tech, the later frames being able to punish air dodges, and the final frames having approach-deterring utility. Overall, it is one of Shulk's defining moves, as it can start combos while Jump, Speed or Buster are active, which can lead into a grab, neutral attack, forward tilt, up tilt, aerials or Air Slash. It can also neutralize weak projectiles, such as those from Toon Link or Diddy Kong. However, its long-lasting hitbox and very high ending lag (46 frames) make it a very unsafe move to use off-stage when fast falling, as Shulk will be in serious danger of self-destructing. 8% (blade), 6.5% (beam) A downward slash. It has the lowest amount of ending lag out of his aerials (24 frames) and low landing lag (10 frames), while its range grants it excellent coverage for an aerial, which makes it great for interrupting approaches and spacing. It is also a dependable combo option with either Speed or Buster active, and a powerful edge-guarding move, as it can easily cover their options (in Jump) or KO them outright while offstage at percents as low as 50% (with Smash). In Jump/Speed/Buster, it can allow Shulk to perform a wall of pain ending with Air Slash; this is a damage/KO combo at certain percentages, which has been dubbed the "Fair Slash" combo by players. Behind Thrust 12.5% (blade), 8.5% (beam) A delayed reverse gripped thrust. The Monado's blade deals respectable damage with high knockback growth, making it a powerful KO move; it KOs at the edge at roughly 94%/137% (blade/beam) without Arts, and 65%/85% in Smash. It has lost its initial blade hitbox near Shulk's body from Smash 4, but is no longer as punishable due to its reduced landing lag (11 frames). Hence, it is a useful spacing tool due to its high horizontal range, but only if spaced spaced correctly or alongside Jump/Speed's aerial drift. However, it has slow start-up (19 frames) and a narrow, brief hitbox, making it very difficult to time; a few consistent methods are to perform it at the peak of short hop before fast falling without Arts, or immediately out of a short hop in the Speed Art. 5.5% (hit 1), 10.5% (hit 2 blade), 8% (hit 2 beam) An upward thrust, which causes the Monado to reveal its beam blade. Like his forward and up smashes, the first hit from the Monado's blade leads into the second hit from its beam blade. It has tremendous vertical range that is capable of reaching through the main platform of Town and City; however, it has very minimal horizontal range and each hit only lasts 2 frames, which can make it difficult to connect with, especially if Shulk has too much momentum. It is one of the most damaging up aerials in the game if both hits connect (sweetspot only); coupled with its second hit's high knockback growth, it is a fearsome (albeit difficult to land) KO option near the upper blast line. It also has the second lowest landing lag out of Shulk's aerials (9 frames), giving it some spammability if under a platform. If the second hit of an up aerial lands, Shulk can land, switch into another Art, and combo into another up aerial; this is a KO confirm known as the "Monado Cyclone" that can work at a wide percent range with the right Arts active, though it is quite difficult to set up. 7.5% (hit 1 blade), 6% (hit 1 beam), 11.5% (hit 2 blade), 10.5% (hit 2 beam) A downward thrust, which causes the Monado to reveal its beam blade. Like his forward and up smashes, the first hit from the Monado's blade leads into the second hit from its beam blade. The second hit meteor smashes if the blade hitbox connects. Like his up aerial, it has minimal horizontal range, each hit only lasts 2 frames, and its first hit might not connect into its second hit if Shulk is moving too fast. However, it has excellent range and high knockback, making it a decent edge-guarding option, as it can stage spike edge-hanging opponents, reach distant offstage opponents, or even KO outright at the edge starting from 108%. The first hit can also drag opponents offstage for a meteor smash if they are standing right next to a ledge. It has high landing lag (14 frames), making it punishable if missed. — Reaches out with his left arm. 1.2% Hits the opponent with the Monado's pommel. It is moderately fast and has middling damage for a pummel, but it becomes the strongest pummel in the game (in terms of damage-per-hit) with Buster active, as it will deal 1.8%. 3% (hit 1), 5% (throw) An upward swipe. It lacks true follow-ups because of its base knockback, but it can lead into a dash attack or a forward aerial at low percentages with Speed or Buster active. With the Smash Art active, it is a powerful KOing option, doing so at about 110% at the edge of Final Destination. It is also capable of locking nearby floored opponents, a trait shared with all of Shulk's throws. 3% (hit 1), 6% (throw) Pulls the opponent behind himself and performs a reversed gripped thrust. Shulk's most damaging throw and causes the opponent to suffer back-facing knockback, which allows it to be used as a set-up for a Back Slash. With Smash active, it is one of the strongest back throws in the game, as it KOs around 90%, surpassing Ness's back throw. 3% (hit 1), 4% (throw) Heaves the opponent in the air and performs a kneeling upward thrust. It is mostly used for aerial mixups since it cannot true combo into most attacks: at low percentages and/or with Buster active, it can lead into up tilt or Air Slash, or a ground attack if the opponent air dodges. With Jump active, it can lead into a neutral aerial or forward aerial, the latter of which requires the opponent to DI away. At high percentages, it can act as a set-up into the "Monado Purge" combo, which is an up throw to up aerial, though this is extremely situational since opponents can air dodge out of it in any direction. 3% (hit 1), 4% (throw) Pins the opponent to the ground and thrusts the Monado into them via a jumping stab. With no Arts active or any Art active aside from Buster, it lacks combo or KO potential because of its throw hitbox's base knockback and very low damage output. However, it is an excellent combo throw with Buster active, as it can follow up with down tilt or forward tilt at low to mid percents, forward smash, forward aerial or Air Slash at mid percents, and even start a KO combo into Air Slash or other attacks if Buster is buffer-canceled during the throw's animation. 7% Slashes around himself while getting up. 5% Slashes around himself while getting up. 7% Performs an inward slash while climbing up. Smash: 8s duration, 16s cooldown Activates one of five Monado-based Arts: Jump, Speed, Shield, Buster, or Smash. Each Art significantly enhances particular attributes at the cost of significantly hindering others, and all last for varying durations unless manually canceled. A wheel can be used by holding the Special button, selecting an Art, and then releasing the Special button, which instantly activates an Art even while in hitstun; alternatively, the special button can be pressed once to cycle through each Art manually, and pressed thrice to cancel a current Art. Each Art has varied cooldown times and durations. Shulk poses and announces an Art's name if it activates when he is not attacking or dodging; this grants 14 frames of intangibility and can be used to replace landing lag animations or change directions in midair. This is pivotal for several Monado Art-based advanced techniques, including the Monado Art Landing Lag Cancel and Dial Storage. Back Slash 10% (blade), 9% (beam), 16% (back hit blade), 14% (back hit beam) A leaping downward slash, with Shulk occasionally yelling “Back Slash!” during the move. The Monado's blade beam glows red during the move, referencing Physical Arts in his home game. Shulk takes a small leap forward upon start-up, giving it slightly more range and allows him to jump over small projectiles. The distance of the leap can be adjusted by holding left or right during the leap. True to its name, it deals more damage and has higher knockback if it hits the opponent's back: the blade/beam hitbox will KO at around 74%/88% at the edge. Conversely, the front hitbox is incapable of KOing till excessively high percents, unless in the Smash Art. It has recovery potential since it snaps to the ledge if started at a height slightly higher than the top platform of Battlefield, though it is risky since the move cannot be canceled. Air Slash 6% (hit 1 blade), 5% (hit 1 beam), 5.5% (hit 2) A jumping upward slash, similar to Dolphin Slash, with Shulk occasionally yelling “Air Slash!”. The Monado's blade beam glows pink during the move, referencing Break Arts in his home game. It is a natural combo: its first hit has set knockback, while pressing the attack button again will result in a second hit, which is an outward slash that grants a small vertical boost, especially if used late. Its second hit has extremely high knockback growth, which makes it a useful KOing option, especially from out of shield; its second hit KOs approximately at 106% near an edge. The Jump Art increases vertical distance gained by the first slash. However, the Jump Art can cause the natural combo to whiff due to the additional vertical distance. The first slash will automatically snap to ledges during its ending frames. Vision 10% (normal minimum), 13% (forward-held minimum) A counterattack involving Shulk using the Monado to foresee an attack. If he is hit, Shulk retaliates with a slow, powerful, and long-ranged slash that launches opponents forward. Alternatively, holding forward while counterattacking on the ground causes a fast dashing slash that deals more damage and knockback growth in addition to launching opponents backward, but its speed and Shulk's momentum can cause it to occasionally miss its target. Previously one of the strongest counters in Smash 4, its knockback scaling has since been lowered and it has lost its unblockable properties, lowering its notorious power. Despite this, it now has no sweetspot or sourspot, making its damage consistent, and Monado Arts can affect the KO potential of the counterattack. As a downside, Vision loses counter frames if repeatedly used over a short period of time, making it and Witch Time the only counterattacks that lose effectiveness if spammed. Counter frames are regained over time or once Shulk is KO'd. The counterattack resembles Stream Edge, one of Shulk's Physical Arts. Chain Attack 3% (hit 1), 2% (hits 2-12), 12% (hit 13), 5% (hit 14) Traps opponents in a bright ball of light. If it hits, Shulk summons Dunban, Riki, and Fiora to perform a Chain Attack on the opponent, which he then concludes with a powerful slash. Chain Attack's damage output and knockback are also affected by Monado Arts. However, it has a short range, as Shulk needs to be close to the opponent in order for its first hit to land. In addition, Arts can expire during the Chain Attack's cutscene, which affects its damage output and knockback. Jumps down onto the stage while performing a downward slash using the Monado. Shulk then quickly turns his back to the screen and places the Monado on his back while Buster's symbol flashes briefly. Shrugs, shakes his head, and waves a hand as if lecturing someone while saying "Now it's Shulk time!" (穏やかじゃないですね?, Not being gentle, huh?). The animation itself resembles the one Shulk performs when engaging in a conversation in Xenoblade Chronicles. The English phrase is a reference to Reyn, his best friend and one his party members, who utters the phrase "Now it's Reyn time!" whenever his Talent Art gauge is completely filled during combat. The Japanese phrase similarly references a popular phrase in Japan; in this case, a line Shulk commonly says when accepting quests. Grips the Monado's handle with his right hand while triumphantly pumping his left fist and announcing "I'm really feeling it!" (だんだん乗ってきたよ!, Gradually getting the hang of it!). This is one of the lines Shulk may announce in Xenoblade Chronicles when his tension level increases in combat. Grips the Monado with both hands, activates it and poses similarly to when he activates Buster while saying "This is the Monado's power!" (モナドの力よ!, The Monado's power! / The power of the Monado!). If timed correctly, it can dodge certain projectiles, such as Blaster, Bow and Arrows, and Palutena Bow. This is one of the lines Shulk may announce when he activates the Monado's Talent Art in Xenoblade Chronicles. Taps his foot while thinking about something. It is based on his idle animation from Xenoblade Chronicles. Tenses and quickly looks behind himself, then in front of himself before easing up. Raises the Monado, activates it, and swings it in an outward, downward arc. He then deactivates it and places it on his back, saying either "I got through that pretty good!" (よかった、これで解決ですね。, All good, it's been quite resolved.) or "This is a good result!" (結構よい仕上がりだね？, It was a splendid completion, huh?). Swings the Monado twice while it is active (the first swing is inward with both hands, and the second is an outward swing with his right arm). Then he holds it level to his head (horizontally lengthwise) as it deactivates, saying either "The future is ours to decide." (みんなの気持ちが伝わってきたよ！, Everyone's feelings have been coming through!) or "I've got a good rhythm going!" (ほんと、いい流れがつくれているよ！, For real, this makes it a good flow!). Bows down with the Monado held lengthwise, with the Monado activating before Shulk holds it in a reverse grip, saying either "I can feel the power!" (うん、力を感じる。, Hmm, I feel the power.) or "I can change the future." (未来は…変えられるんだ！, The future… I can change it!). The second half of the riff of You Will Know Our Names, the battle theme used in Xenoblade Chronicles when fighting a unique monster, slightly sped up. Darkshad - Placed 2nd at Holiday Heist 4: Ultimate Edition. Darkwolf - The best Shulk player in Canada. Kome - Placed 9th at Umebura SP 2 and 25th at Sumabato SP. Larry Lurr - Has taken a set off of Zenyou while using Shulk. Nicko - Placed 9th at SoCal Chronicles, 17th at Collision 2019, and 65th at GENESIS 6. Soronie - Placed 17th at Super Splat Bros.
SoulArts - Placed 25th at Collision 2019 and 17th at Orion 2019. Each of the opponents represent one of Shulk's Monado Arts and are fought in the cycling order of each art in Super Smash Bros. 4. The battle against Mega Man, continuing the theme, represents Monado Enchant from Xenoblade Chronicles (represented by the kanji for "Machine"), which shares the Monado's ability to damage Mechon armor with his party. Shulk was among the fighters that were summoned to fight the army of Master Hands. After the Master Hands begin turning into energy for Galeem to absorb, Shulk experiences a vision of the future, where all of the fighters are annihilated and the universe engulfed in light. Shulk turns back attempting to warn everyone, but remains speechless. Unfortunately, his vision comes true when Galeem unleashes a shower of light that vaporizes Shulk off-screen and imprisons him with the rest of the fighters except for Kirby. In the mode proper, he can be found right over a cliff that leads to a waterfall. The area Shulk can be found at is rocky and grassy with many water features, reminiscent to the appearance of Gaur Plains. The Camilla spirit must be defeated right before he can be challenged. Shulk's Fighter Spirit can be obtained by completing Classic Mode. It is also available periodically for purchase in the shop for 500 coins. Unlocking Shulk in World of Light allows the player to preview the spirit below in the Spirit List under the name "???". As a Fighter Spirit, it cannot be used in Spirit Battles and is purely aesthetic. Each Fighter Spirit has an alternate version that replaces them with their artwork in Ultimate. Idling on the Great Plateau Tower. Activating the Smash Monado Art on Battlefield. Shulk fighting Samus on Gaur Plain. Crouching near Snake on Shadow Moses Island. Shulk getting attacked by Lucina on Temple. Getting hit by Sonic's Spin Charge on Mario Galaxy. Shulk, Link and Marth advancing towards Rathalos on Coliseum. Shulk activating the Buster Monado Art on Battlefield. 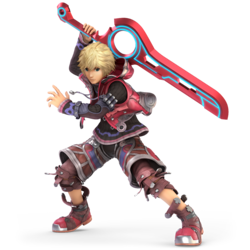 Shulk's pose in his official render resembles the pose he performs when selecting Monado Arts from the move's menu. Shulk's artwork was one of the three that have been updated on the official site, alongside Falco and Palutena. In his case, the lighting on his hair and face have been modified, making his features appear less flat. In the Gourmet Race section of the World of Light, a visual glitch occurs when the "New Record!" announcement appears. After it shows, Shulk will run with the Monado in hand until he performs another action. Shulk's backhanded victory pose has an animation inconsistency: his mouth may either stay open or closed when his name is called out on the victory screen. Shulk is one of the few fighters to spin differently in their Star KO: he spins forwards instead of away from the screen, similarly to how Star KOs acted in Smash 4. He shares this trait with Cloud, Corrin, Incineroar and Inkling. This page was last edited on April 17, 2019, at 23:43.